This Easter, Cheetos invites you to visit CheetosEaster.com to input the Bag Code found on any specially-marked CHEETOS bags for a chance to win the CHEETOS Mystery Egg Challenge 2018. 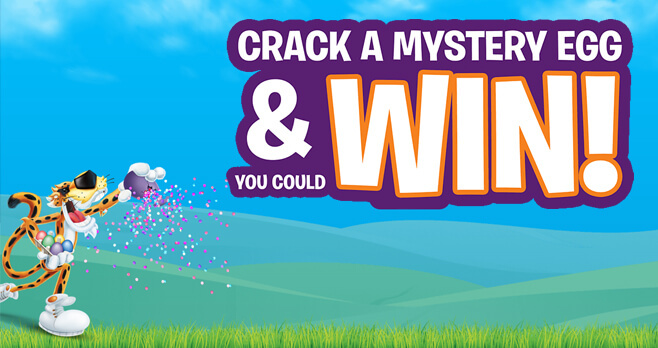 Crack open your egg and you could win eggcellent prizes. Over $60,000 in prizes. Who Can Enter? The CHEETOS Mystery Egg Challenge 2018 is open only to legal residents of any of the 50 United States, the District of Columbia and Puerto Rico who are 13 years of age or older at the time of participation. When To Enter? Sweepstakes begins at 12:00:00 p.m. (noon) CT on February 19, 2018 and ends at 11:59:59 p.m. CT on April 1, 2018. What Is The Mystery Egg Challenge Prize? The Prizes consists of either a drone, tablet, wireless speaker, phone printer, wireless earphones, digital camera, Instant film camera, Powerstation charger, smartphone camera lens kit, or waterproof speaker. Who Are The CHEETOS Sweepstakes Winners? For the names of the winners, send a self-addressed, stamped envelope to be received by April 30, 2018 to: CHEETOS® Mystery Challenge Winner’s List, 10 South 5th Street, 7th Floor, Dept. 881-765, Minneapolis, MN 55402. My bag has a,code that’s not being accepted why us that? It says 9-11 numbers. I put my nine digit code in and it’s not working. Always something with your promos! Guess I don’t get to play the game. I dont want to play for free. Umm I’m sure Free wont let me win anything! I brought four bags of Cheetos for this to happen that just stinks ugh! By the way the codes should be inside the bags by themself with no other numbers around them plain and simple. I have tried to many times.. this game is like Frito-Lay company.. !!! A TOTAL FARCE !!! IF you can’t run a program get off it. I DO know my e-mail address. don’t tell me it doesn’t work…. Here is my thought !!! SCEWED UP LIKE A JAP FOOTBALL BAT !!! FRITO-LAY GOOD PRODUCTS BUT..
Like the management it’s real bad.. I KNOW !!! I worked for Frito=lay in Jacksonville Fla.. TOTAL SHAME !!!! This site refuses to let me put in my codes. I have bought multiple bags of large hot cheetos but every code is getting denied. How does a lawsuit for false advertisement sound? Tried over a dozen times re-entering my code and it still won’t accept…this is bull cr@p! Unable to enter codes. Tried several times. This is ridiculous. Unable to open like everyone else-Kinda frustrating ! Having the same problem as everyone else. I expected a reply from the company by now. Ugh!